USD is being supported due to the US treasury yields and the Fed rate-hike. 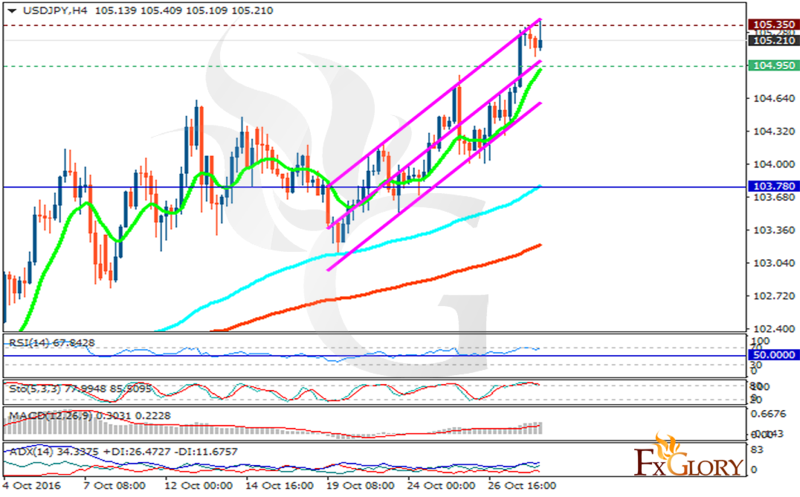 The support rests at 104.950 with resistance at 105.350 which both lines are above the weekly pivot point at 103.780. The EMA of 10 is moving with bullish bias and it is located above the EMA of 100 and the EMA of 200. The RSI is moving in overbought area, the Stochastic is moving horizontally in its maximum rate and the MACD indicator is in positive territory. The ADX is showing stronger buy opportunity than sell. There is no clear signal at the moment since 105.3 area seems to be such a strong resistance zone and despite the pair’s bullish trend, there might be pullbacks soon. Traders can wait for a better chart setup.